Spirit Storm by E.J. Stevens. A Spirit Guide Novel. Review: You think your life is falling apart? Well, Yuki has a pretty normal life, other than the fact that She Smells the Dead. Sequel of She Smells the Dead, Spirit Storm, a Spirit Guide Novel, is written by E. J. Stevens. Yuki is happy with her best friend Emma and her boyfriend Calvin (Cal), but what is the fate of the people she loves? Not many people know that Yuki smells impressions of the dead, other Emma and Cal. Also, it isn't a very well-known fact that Cal is a werewolf. Only Yuki, Emma, and Simon, and older werewolf in the wolf pack, know of Cal's werewolf spirit and him being the pack alpha. But when Yuki, Cal, and Simon go to save Sam, another werewolf (held captive in a dark cave), Cal gets seriously injured. Only good medical care and Yuki can help him. How? When Yuki dances, she can get in touch with Cal's inner wolf spirit. Will Yuki be able to awaken Cal, or will he lie in his cabin bed until the worst happens? On top of it all, on Samhain (Halloween) the spirits will awaken. How will Yuki survive the attacking smell of so many spirits? Will she survive the smell? I absolutely love Spirit Storm for so many reasons! First of all, it has a fast-paced plot. It keeps going, and doesn't stop when a solution doesn't come immediately. The characters are well-developed and very essential to the plot. Spirit Storm is a fantasy realistic-fiction, and contains werewolves and smelly spirits. Yuki's sleuthing skills to solve her Samhain problems are very detective-like. It would be best to read She Smells the Dead (1st Spirit Guide Novel) to best understand Spirit Storm, including the characters and the basic plot itself. I think it is very interesting how there is fantasy, adventure, and romance all combined in one novel. It is quite original how there is a significant, yet small part in werewolves and spirits. 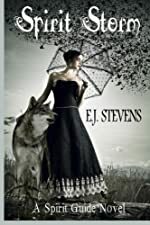 Though the book is based on werewolves and spirits, E. J. Stevens also incorporated some high school adventures. There is also the adventure of rescuing Sam, and Cal and Yuki's romance. If you like these combinations of genres, I suggest you read this book. I rate Spirit Storm a 5 out of 5. We would like to thank E.J. Stevens for providing a copy of Spirit Storm for this review. Have you read Spirit Storm? How would you rate it?